While the small blade grinders available in most stores will get the job done, they do not produce the consistent grind that will provide the best possible extraction. They also heat the coffee, which can affect the final flavor of your brew. Burr grinders produce grinds of equal size and are preferred among most coffee connoisseurs, but they can be large and bulky. Having a grinder and coffee maker all in one unit is a great compromise between design, function, and convenience. The following looks at five of the most popular grind and brew systems on the market in order to help you find the best coffee maker with grinder for your kitchen. The Black & Decker Mill and Brew measures 10 x 13.5 x 15.5 inches and weighs just under 10 pounds. It offers quick touch programming featuring large buttons and a backlit display that allows you to view your settings. The machine comes with a reusable filter, which allows you to save money and reduce paper waste. 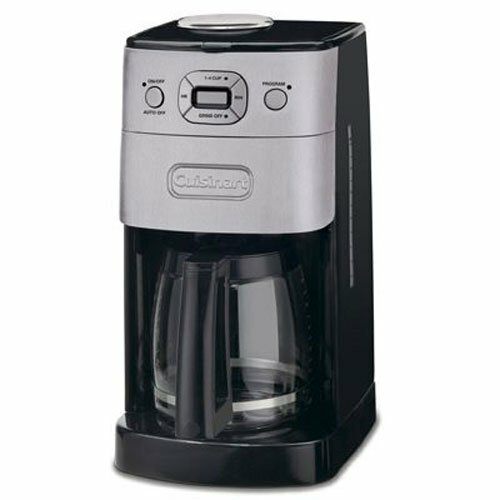 The Black & Decker Mill and Brew features a blade grinder that is integrated into the reusable filter. The machine has an option for turning off the grinder if you choose to use pre-ground coffee. 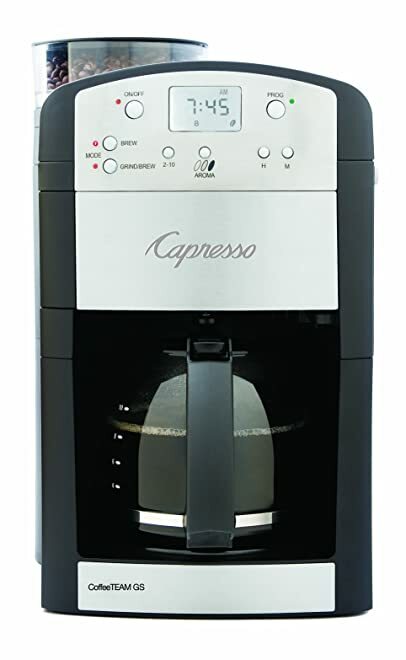 The attached grinder is relatively quiet as far as coffee grinders are concerned, so you will not have to worry about waking the neighbors if you are an early riser. Can the Grinder be Replaced? The grinder is attached to the reusable filter. In theory, it can be replaced, but this would require contacting the company or searching online since it is unlikely that you will find a replacement in a local store. The Black & Decker Mill and Brew allows you to customize the strength of your brew. It also has an option for brewing small batches for those times when you are not making coffee for a crowd. The machine also incorporates technology that will temporarily stop the brewing if you too impatient to wait for that first cup. The grinder does an adequate job but does tend to produce a few inconsistent pieces. There is no hopper, so you can only grind what you need for each use. You can grind enough beans to brew up to 12 cups of coffee. 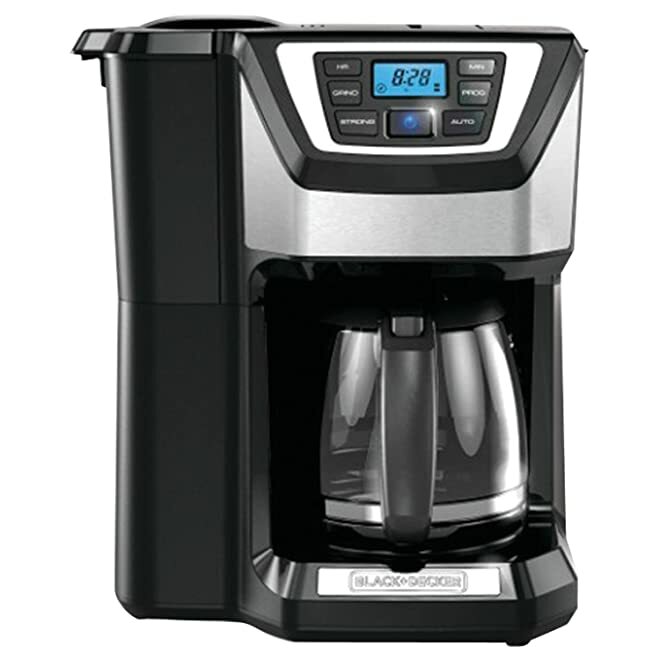 Energy Efficiency: The Black & Decker Mill and Brew has an energy efficient automatic shut-off function. Ease of Cleaning: The carafe is dishwasher safe, and the filter and grinder assembly is completely removable for easy clean-up. Black & Decker offers a 2-year limited warranty. The Black & Decker Mill and Brew is the most budget-friendly combination grinder and coffee maker on this list. It is also easier to disassemble and clean than some of the more expensive models. The reusable filter and automatic shut-off feature make the machine relatively eco-friendly. You do have to push the power button twice in order choose your brewing options. The machine also goes into sleep mode within a few seconds, so you may have to press the power button again if you take too long to make your selections. The water reservoir has a relatively narrow opening, which can make it a little difficult to fill. 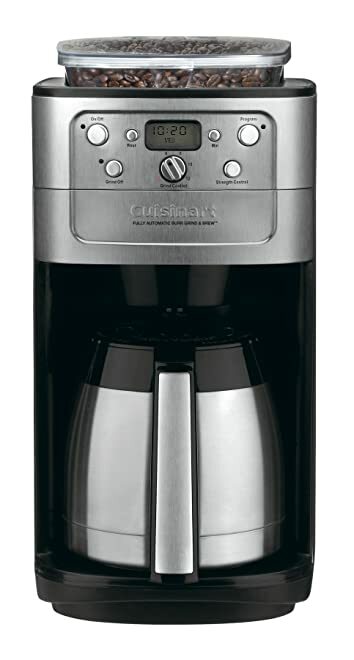 The Cuisinart Grind and Brew measures 10.7 x 8.4 x 16.2 inches and weighs just under 10 pounds. The machine is sleek and has a high-end appearance. The exterior is made from stainless steel, which provides the durability that you would normally expect from a Cuisinart appliance. Instead of a warming plate, this Cuisinart model has a thermal carafe. The Cuisinart Grind and Brew features an automatic burr grinder that can be turned off when using pre-ground coffee. This machine somewhat quieter than similar grind and brew machines. The grinder cannot be replaced. If it fails, you can still make coffee using pre-ground coffee, but you would have to get a separate grinder if you choose to purchase whole beans. 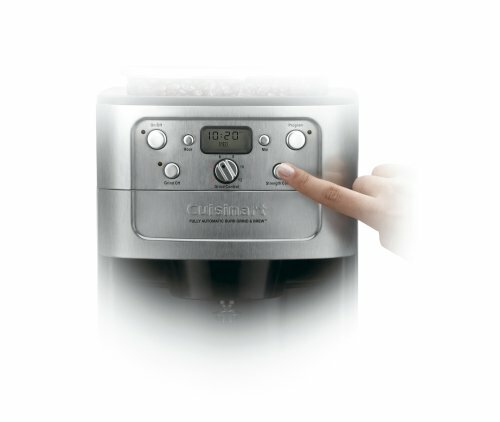 The Cuisinart Grind and Brew is fully programmable and has grind and strength controls that allow you to adjust the volume and intensity of the brew. The thermal carafe holds up to 12 cups of coffee. The machine also comes with a brew-pause feature, so you can grab your first cup quickly. The grinder hopper holds up to a half-pound of coffee beans. 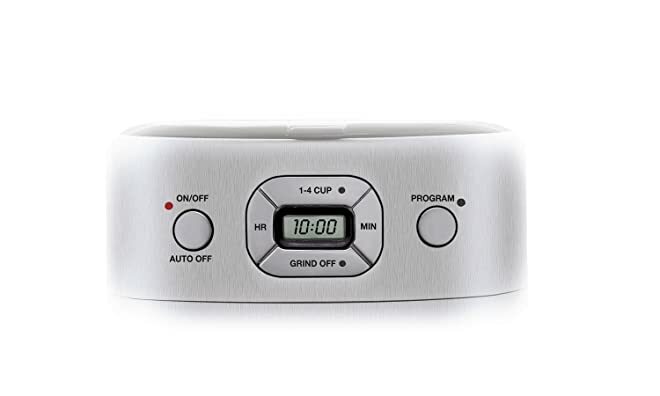 The Cuisinart Grind and Brew offers an automatic shut-off function to reduce energy consumption. The fact that the machine does not have a warming plate also contributes to its energy efficiency. The carafe, filter basket, and hopper are all dishwasher safe. The machine also comes with a scoop with an attached brush that can be used to remove loose grounds from the coffee chute. While the process is not overly complicated, there are a number of parts that must be cleaned on a regular basis to ensure the best tasting coffee. The Cuisinart Grind and Brew comes with a 3-year limited warranty. The machine comes with a commercial style permanent filter and charcoal water filter to ensure that your coffee tastes as fresh as possible. While it may take a little trial and error to fine tune your grind and water ratio, the Cuisinart can deliver a consistently delicious cup of coffee. The machine is relatively tall, which may be problematic if you have low-hanging cabinets. You are essentially left with half a coffee maker if the grinder should fail since it cannot be replaced. The Capresso CoffeeTeam measures 9.2 x 9.2 x 15.2 inches and weighs 10 pounds. The exterior has a modern aesthetic with stainless steel accents and digital control panel. The machine comes with a built-in water filter and reusable filter. The Capresso CoffeeTeam features a conical burr grinder. The grinder does a good job of producing a consistent grind; however, it is rather loud and slow. 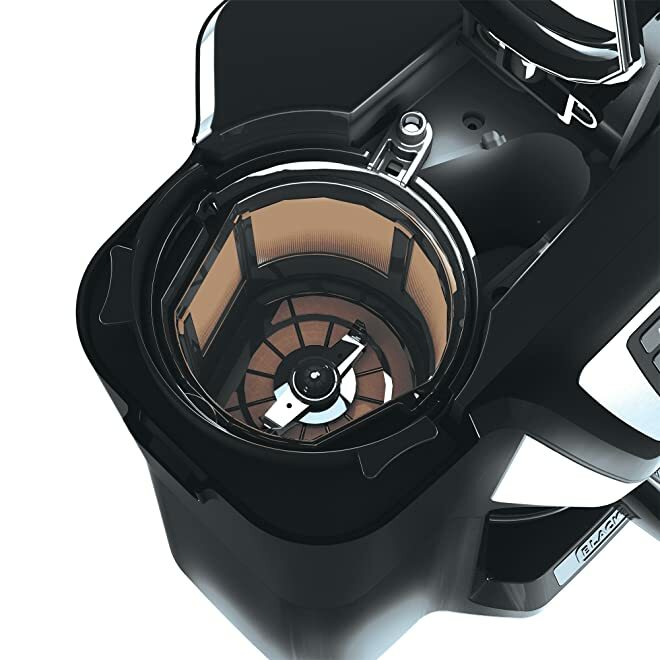 The grinder is built-in and cannot be independently replaced; however, the machine still allows you to brew pre-ground coffee without the grinder function. The glass carafe holds up to 10 cups of coffee. You can choose from five different grind settings based on your preferred type of coffee bean. You can also adjust the brew strength and volume. The Capresso can even be programmed to grind and brew automatically. The hopper holds up to 6 ounces of beans. The Capresso has a 2-hour automatic shut-off feature. The design of the Capresso could be improved to make it easier to clean. The hopper cannot be removed, so it is difficult to get rid of all of the old ground residue. The lid on the carafe also does not pop off, which makes it a little harder to clean. The Capresso comes with a 1-year limited warranty. The Capresso gives you more options in terms of choosing your grind than some of the other models reviewed. The grinder provides a consistent brew as long as you take the time to brush out the chute every so often. The hopper and carafe size are small for a machine at this price point. You also cannot dump out any unused beans if you decide to switch to a different coffee. The noise factor can be a problem if you have family members that get up at different times. This Cuisinart model measures 8.1 x 11.2 x 15 inches and weighs 9 pounds. It has the sleek stainless exterior that you expect with most Cuisinart appliances. This model has fewer bells and whistles compared to the other Cuisinart model reviewed and features a glass carafe and warming plate instead of a thermal carafe. The digital display and push button selections are convenient and easy to use. This Cuisinart model features a blade grinder. Both Cuisinart models are slightly less noisy than some of the other models reviewed. This Cuisinart model features a separate grinder assembly to make it easier to add beans and remove used grounds. A replacement grinder assembly can be purchased online. This machine offers full 24-hour programmability and can be set to automatically brew up to 12 cups of coffee. You can use the 1 to 4-cup small-brew option to ensure the best possible extraction when making a small amount of coffee. The permanent coffee filter and charcoal filtration system will ensure that your coffee is as fresh as possible. You do have the option of grabbing a cup of coffee mid-brew if you just cannot wait. Unlike the more expensive Cuisinart, this model does not include a large hopper. It will hold enough beans to make up to 12 cups of coffee. The warming plate has a power-saving shut-off feature that can be set for up to 4 hours. The Cuisinart does have multiple parts that must be cleaned after each pot to ensure the best flavor, which can be somewhat inconvenient. Cuisinart offers a 3-year limited warranty. The quality construction should stand up to long-term daily use. You also have the option of optimizing the extraction for brewing less than 5 cups of coffee. The fact that the grinder assembly can be replaced is a plus. The lack of a hopper is rather inconvenient when making larger amounts of coffee. There is also a lack of control over grind quality and brew strength. The KRUPS Grind and Brew measures 11.2 x 11.5 x 15.5 inches and weighs a little over 8 pounds. The machine features a backlit digital clock and user-friendly push button controls. While the exterior is designed attractively, it is primarily plastic, so it does not appear as high-end as some of the other models reviewed. The KRUPS Grind and Brew has a conical burr grinder and five grind settings ranging from coarse to fine. The noise created by the KRUPS Grind and Brew is on par with similar grinders. The grinder is built-in and cannot be detached and replaced independently. The machine does have an option for brewing coffee without the grinder. 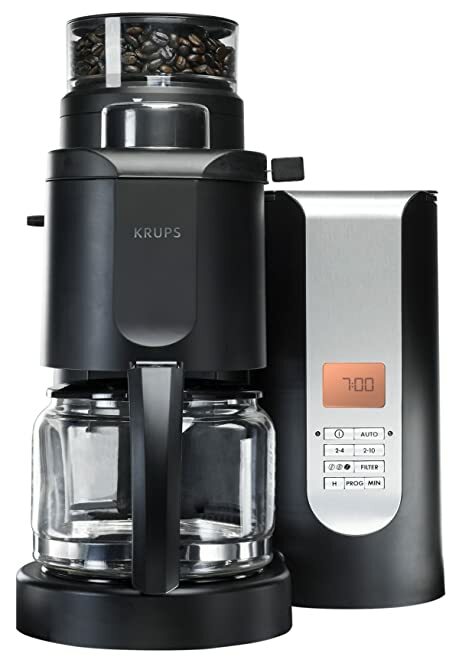 The KRUPS Grind and Brew allows you to select from three different strength settings and has an aroma function for maximizing the flavor of smaller quantities of coffee. 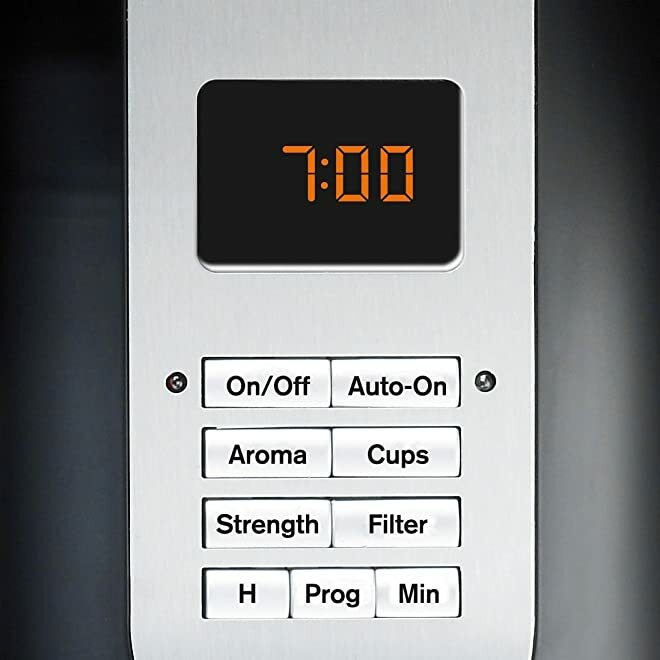 You can program the machine to automatically grind and brew your coffee at a specific time. The warming plate will keep your coffee at serving temperature for 2 hours. The hopper will hold enough beans to make up to two full pots of coffee. The burr grinder produces a consistent grind and will only grind enough coffee for the number of servings selected. The warming plate on the KRUPS Grind and Brew turns off after 2 hours for safety and energy efficiency. The glass carafe can be washed by hand or in the dishwasher. The hopper and coffee chute have to be cleaned with a brush. The KRUPS Grind and Brew gives you more control over grind size and strength than some of the less expensive models. The hopper allows you do make multiple pots of coffee without having to refill. A number of users have had issues with the grinder or heating element failing after a couple of years of use, which is much faster than you would expect at this price point. The carafe only measures 10 cups, which is somewhat small when serving coffee to a group. The machine does not automatically come with a reusable filter, which you might expect considering the price point. The Black and Decker CM5000B Mill and Brew is the most budget-friendly option. While some coffee connoisseurs may not like the fact that it does not come with a burr grinder, it will meet the expectations of the average coffee drinker. When it comes to higher-end coffee maker and grinder combination units, the Cuisinart DGB-900BC Grind and Brew with Thermal Carafe seems to find the right balance between quality construction, performance, and design aesthetics.